Fully packed: N8 fails to build on its impressive hardware and features. Nokia doesn’t make smartphones. It makes “kitchen-sink" phones. Phones rippling with unadulterated brawn where others embrace minimalism or elegant simplicity. The N8 is the Finnish company’s latest desperate gamble for relevance in a high-end smartphone category rapidly moving away from it. 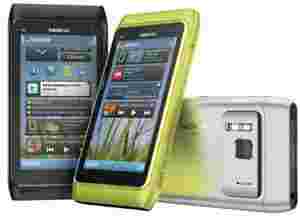 Two years ago, when the Symbian operating system-powered N97 appeared in response to the then-looming threats of the iPhone and Android, Nokia’s kitchen-sink approach (32 GB onboard memory, 5-megapixel camera, FM transmitter) failed to stem the tide of Symbian deserters. The N8 seems to be making the same mistake in 2010. While it has upgraded the beefiness (12-megapixel camera, FM transmitter, HD output), it seems to have forgotten what made the N97 an also-ran in the smartphone race—poor software. Nokia’s OS of choice has evolved at a sadly languid pace. The N8 sports the much-ballyhooed Symbian^3, the iteration of Symbian that’s supposed to bring it on a par with the smartphones of today. It’s the same, familiar, gloriously convoluted operating system India’s mobile generation has grown up with. In almost every basic task—from sending emails to messaging—it’s beaten hands down by Android, iOS or the BlackBerrys. So when the N8 throws up an onscreen numeric keypad instead of a Qwerty keyboard when you hold the phone upright, that’s not warm nostalgia seeping through your arms. It’s exasperation. Hardware-wise, though, the N8 is excellent. It’s a stunning piece of engineering. Nokia still makes the world’s sturdiest phones, and the N8 is built to last decades. The anodized metal exterior is sleek and strong, and it looks refreshingly different from every other smartphone out there. Not all of its five available colours will fly off the shelf (green, anyone? ), but the variety is appreciated. The capacitive touch screen is nice and bright, and the brilliant scratch-proof “Gorilla Glass" cover should be a standard feature on every phone. The camera unit on the back protrudes slightly from the smooth frame, but doesn’t take too much away from the overall design. The 12-megapixel camera is absolutely fantastic. The flash is solid, the autofocus efficient, and the resulting photos wonderful. This is truly a camera phone that can replace your digital camera. The easy on-board camera software is also a rare shining point in the turgid mess that is Symbian. Video and music playback is very impressive. Drop your Divx or Xvid videos and the N8 plays them back with no problem. The revamped music player is also spiffy, and sound quality is good. From here, things start going downhill. Technology blog Gizmodo has rather infamously refused to review the N8, calling it the equivalent of a “top-of-the-line horse-drawn carriage released shortly after Neil Armstrong stepped on the moon". The sentiment is understandable. Symbian^3 is quite a step back from the operating systems we’re used to. Things that should take one click take three. Too many vital options are buried under a maze of menus. The N8 doesn’t zip through tasks the way a Galaxy S or iPhone 4 does—it’s merely functional. Symbian^3 is, in my opinion, on a par with Android 1.5—but Google’s OS iterates with breakneck speed, while it’s taken Nokia about two years to get to this stage. At Rs26,259, the N8 enters a crowded field of top-class smartphones. On the hardware front, it beats every one of them hollow. No other phone gives you such an impressive set of features, or build quality this good. But its ancient software fails to build on this strength, making the N8 a difficult phone to recommend. If you’re looking for a good camera phone and don’t mind software from the Palaeolithic age, the N8 is the phone for you. For everyone else, this feels like a requiem for the operating system that introduced all of us to mobile phones.